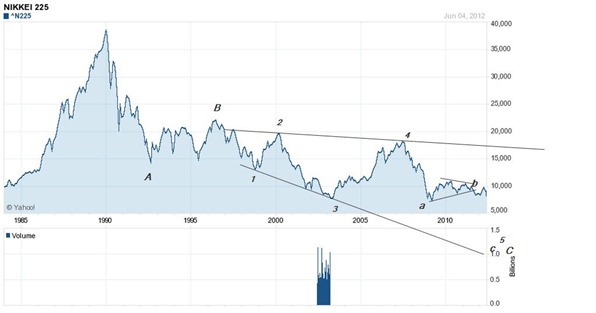 Heard the other day that the TOPIX index in Japan had made a new absolute low since the highs of ‘89. The Nikkei 225 is not quite there yet but it did drop about 2000 points in the last two months. So far it is following our script quite accurately and the news seems to be getting worse with each passing day. We are looking for the 5th wave of this diagonal to complete. There is no precise point as it may go all the way to the trend-line or stop well before that. 5000 to 4000 is a reasonable guess but much lower levels are possible. See previous blogs.